The venerable art of blacksmithing is not generally considered to be a radical act. But for Michael Martin, a 36-year-old Mennonite from Colorado Springs, the malleability of glowing metal from a forge’s inferno makes it the perfect vehicle for addressing gun violence. Mr. Martin, a former youth pastor, was inspired to learn blacksmithing after the Sandy Hook Elementary School massacre in 2012, in which a deranged young man with an AR-15 assault rifle killed 20 children and six educators. Three months later, Mr. Martin started Raw Tools, a nonprofit organization dedicated to converting the “swords” of contemporary America — handguns, assault weapons and semiautomatic rifles — into garden tools, or erstwhile plowshares, at once fulfilling the Old Testament mandate and forging a new kind of public ritual for processing grief. Raw Tools has been on my radar since its inception in 2012 (after the Sandy Hook massacre) because of Shane Claiborne. I was thrilled to see it pop up in the NYT (albeit in the Opinion section). This project is hands down my favorite literal application of something from the Bible. Prophets like Isaiah (2:4) and Micah (4:3) from the Hebrew scriptures envision the world without war, where instruments of violence can be turned into garden tools. I would normally caution readers of the Bible before taking any specific section too literally, but this is beautiful and necessary. As a Mennonite, Mr. Martin comes from a long tradition of nonviolence and considers his work a form of conscientious objection (“raw” is “war” spelled backward). The first gun he converted into a garden tool came from a friend in Colorado Springs who wanted to get rid of an AK-47 he had bought for protection after the Sept. 11 attacks. I finally read Nelson Mandela’s autobiography Long Walk to Freedom. I say “finally” because I should’ve read the book six years ago when it was on the curriculum for a study abroad program in Zambia that I directed, but I was just too busy with grad school and directing the program that I put it off. What a moving, inspiring story. 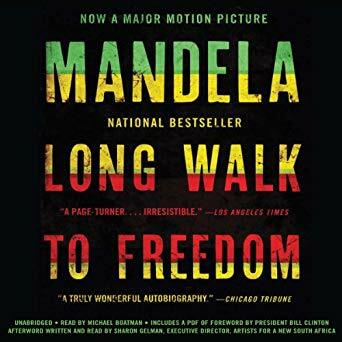 Before reading the book, I knew very little about Nelson Mandela’s life, work, and cause. I hadn’t even read the wikipedia article. If you’re in the same boat, do yourself a favor and learn some about this man’s life. One of the most striking aspects is the sheer amount of time he was in prison—27 years. Talk about patience. He considered his entire time in prison as part of the struggle to end apartheid. Near the end of the book, after he’s released and he’s approaching the first multi-racial election in South Africa’s history, he encourages patience of those black South Africans who think everything might change quickly. This man knew patience. I had cast the first vote of my life. Having just had the mid-term elections in the US, that quote smacked me in the face. The audio version was fantastic and only (ha!) 27 hours long. I haven’t yet watched the movie. A lot has happened in the upper echelons of podcasting this year, and I’ve been tasked with assembling a list of the best shows released so far. In the spirit of acknowledging how bonkers this task is — finding the cream of the crop in an ecosystem as young, relatively decentralized, and maddeningly chaotic as podcasting — I’d like to share my thought process in putting together the list. As a critic, I’m looking for a very specific thing: shows that say something about the medium, push the form forward, and exemplify the best qualities of what podcasts can do. Craft is a little more important to me than the stories themselves, which comes from a more general belief that as important as certain stories are, it’s even more important that they be told well. I’m also valuing podcasts that function well as stand-alone experiences, though I’m fully aware that puts comedy, conversational, and “after-show” programming at a disadvantage. Of course, this also means that more established shows have the additional burden of being ranked against themselves. And finally, all of this is couched within the tastes and preferences of myself, a lowly mortal human. Alright, enough throat-clearing. Let’s jump in. Not a single one makes my list, but that’s unsurprising. I like his emphasis on the craft of a podcast and meta-analysis of what pushes the medium forward. It’s fascinating to see a list of podcasts on Vulture, a clear sign that Serial catapulted podcasting into the public eye. Curious, I clicked to see what the oldest Vulture piece is with the “Podcasts” tag, and it dates all the way to the end of 2007. But there wasn’t another until 2010—one article (! )—and then two in 2011, four in 2012, and six in 2013. Serial was announced in the middle of 2014, launched in the fall, and since there have been a whopping 147 Vulture pieces about podcasts. In short, it only took ten years for podcasting to catch on. The fact that we humans have such a notoriously hard time changing our minds undoubtedly has to do with the notion that “human beings are works in progress that mistakenly think they’re finished,” which belies the great robbery of the human experience — by calling ourselves beings, we deny our ever-unfolding becomings. Only in childhood are we afforded the luxury of inhabiting our becoming, but once forced to figure out who we want to be in life, most of us are so anxious about planting that stake of being that we bury the alive, active process of our becoming. In our rush to arrive at who we want to be, we flee from the ceaseless mystery of our becoming. To show up wholeheartedly for our becoming requires doing one of the hardest things in life — allow the possibility of being wrong and incur the anguish of admitting that error. It requires that we grieve every earlier version of ourselves and endure the implicit accusation that if the way we do a certain thing now is better than before, then the way we did it before is not only worse but possibly — and this is invariably crushing — even wrong. The uncomfortable luxury of changing our mind is thus central to the courage of facing our becoming with our whole being. Again I’m sorry. But I’m not ready to be a hack yet. Maybe later. I have to confess that, as far as the struggle to live in solidarity went, I failed far more than I succeeded. Yet there were moments when, reading Mark with my Peruvian friends and neighbors, their struggles, their wisdom, and their wonderful culture gave me eyes to see. What follows is one example of the ways that reading Mark in solidarity with Peruvians shaped me as an interpreter. I remember attending a conference before our mission team moved to Arequipa. A man who had been a missionary kid in Peru spoke about the work that remained unfinished a generation after his parents had returned to the United States. He interpreted the perpetually unfinished houses of Peruvian barrios as an analogy for the problem—the unsightly image of rebar sticking up from nearly every rooftop. Yet after I had lived in a few of those unfinished houses, hung laundry on their flat roofs bristling with rebar, and watched the families around me build additions poco a poco (little by little), rebar jutting toward the sky became a symbol of hope. Faced with the impossibility of building multiple stories at once but committed to making space for multiple generations of the family, Peruvians leave the rebar sticking out of the roof level so they can tie into the existing structure when they add the next floor of the house. This is a long-term proposition that often becomes the inheritance of the next generation. I can’t see rebar now without thinking of the tenacious hope of the working poor who make up the vast majority of Peru’s population. I’m coming up on 3 years in Arequipa, in large part thanks to Greg. Multitasking is the drive to be more than we are, to control more than we do, to extend our power and our effectiveness. Such practice yields a divided self, with full attention given to nothing. Brueggemann was just interviewed about this book and his short book on money in back-to-back episodes of the Nomad podcast. Here’s the Overcast link. It’s common to equate multitasking with productivity, one of our highest held values in US American culture. Brueggemann isn’t arguing against productivity itself, just the idolatry of productivity. Practicing sabbath is supposed to make me as an individual more human, and us as a society more just. Sabbath is a big no for both; it is no to the worship of commodity; it is no to the pursuit of commodity. But it is more than no. Sabbath is the regular, disciplined, visible, concrete yes to the neighborly reality of the community beloved by God. We used to sing the hymn “Take Time to Be Holy.” But perhaps we should be singing, “Take time to be human.” Or finally, “Take time.” Sabbath is taking time…time to be holy…time to be human. The world is very fuzzy. If you've ever traveled—even just across the neighborhood—and been struck by the experience of similarities and differences, you'll find this interview interesting. Travel anywhere, make sense of the world, and make a difference. What actually is prayer? What happens when we do it? What difference can it make, if any, to the events and circumstances we find ourselves in? Should we expect to sense God in prayer, or perhaps even hear him communicate to us? And if so, why do so few of us ever seem to have these sorts of experiences? For many of us, these questions, and others like them, have led us to a place of disillusionment and prayerlessness. And yet we still yearn for the deep, rooted, holistic connectedness that prayer promises. The episode is called “The Problem of Prayer” but I think of it more as “Prayer after Faith.” It was fascinating to hear a whole episode on a practice so basic (my one year-old daughter bows her head and says “Amen!”) yet so enigmatic to many of us who have moved beyond the faith of our childhood. Tim states it well when he says: many of us go through some sort of faith deconstruction and, while we may come back around on a number of things, prayer can be left out. There's a lot here to address that. Namely, allowing the Divine to work on you in silent contemplation. I listened to this three times over the last couple of months before linking to it, just to make sure it was as good as I thought it was on my first listen. You don’t go to prayer saying “come on, tell me something.” You go and you say, “Ok, this time is yours. I’m going to try to clear my mind and let you be you for a bit.” And I hope when I get up from that, some balance will have shifted a bit…my judgment, my perception will be that little bit less selfish, that little bit less stupid than when I started (18:45). The other thing is much harder to get clear. We don’t fully understand how God brings about anything in the world…Now God has made a world in which there are free and fairly intelligent people as us. We can make a difference of a different order. And what if part of the difference we can make is praying. Here’s a situation…(25:29). He also goes on to talk about being close to the twin towers on 11 September 2001 and seeing the first responders at work, as well as a good bit on the practice of silent contemplation. Nomad is one of my favorite podcasts of all time. Once again, it’s undergoing some change: one Dave (Ward) for another (David Blower). The banter was still good. David talks about his face hurting after the interview with Rowan Williams. And Dave Ward will be coming back occasionally. It seems like it’s only good news for the future of Nomad. You had a mission this week: to notice people doing tiny kindnesses for each other. Thought for the day: in a world where you can be anything, be kind. I love that the mission was to notice. These things are always around us, but we have to practice seeing them. The great interviewer gets interviewed (Overcast)! This is from April of last year. Rob Bell asking Krista Tippett about her own religious upbringing (for those who don’t listen to On Being, that’s how Krista Tippett always starts off her interviews). Incredible quotes from her book Becoming Wise: An Inquiry into the Mystery and Art of Living. The interaction between science and faith. Favorite tv shows and storytelling as a human need. As I mentioned in my recent post, I now listen to Rob Bell’s podcast. It’s consistently good, challenging, and timely. I still like his interviews the best but now I listen to his solo episodes too. Rob started a series at the beginning of April on what he calls alternative wisdom. It’s the “wisdom after wisdom,” or counterintuitive wisdom. Part 1 was particularly good (Overcast). Sit in the waiting. In the silence. In the absence. In the moment when things have fallen apart, be present, because something important is happening. This is probably the hardest advice for someone who is currently there. Sure, in hindsight it can seem helpful. But really be there, live in it, and you just might see something you didn’t see before. Wisdom is being stripped of your identity and waiting. It's in the nothingness that something new will be born. Depending on how you’re doing right now, this definition of wisdom might be easy to accept. Or you might want to punch Rob in the face. Either way, I hope you’ll enjoy the episode. I love spoken-word audio. Audiobooks. Podcasts. iTunes U lectures. It all started with Jim Dale reading aloud the Harry Potter books on family road trips from Arkansas to Maine and back, first on cassette tapes and then on compact discs. Now I live in a city in southern Peru and most days I have a 30-60 minute commute, and I get to listen. We handwash our dishes and hang our clothes on the rooftop to dry, so I get to listen. In early 2015, I started dabbling in podcasts that touched on questions of faith, the Bible, spirituality, and what it means to be human. I had already been listening to a lot of podcasts at that point, but they were almost exclusively tech podcasts. A year in on my little project I wrote about my favorite religious podcasts. At that point, the Smart Speed feature on my favorite podcast listening app, Overcast, had saved me 35 hours of listening time. It has now saved me 143 hours. Did I mention I love spoken-word audio? I’m still going strong with Newsworthy with Norsworthy, the Liturgists, and Nomad, though I’ve tinkered with my podcast app so that The Bible for Normal People, Rob Bell’s podcast, and the Bible Project now play before the other three. That’s right, I now listen to Rob Bell’s podcast and I really like it. His updates on his book tour and speaking appearances can be a bit laborious at the beginning of every episode, but it’s a free podcast and his platform is how he makes his living so I respect the self-promotion. The actual content of the episodes is phenomenal and accessible. And, as was the case two years ago, his interview episodes are incredible (e.g. this one where he interviews Pete Holmes about his HBO show Crashing or this one where he interviews Krista Tippett). I still can‘t bring myself to say “the RobCast” though. The Bible Project is a non-profit that creates videos and podcasts to explore biblical themes and the literary structure of the Bible. Their mission is to show that “the Bible is a unified narrative that leads to Jesus and has profound wisdom for the modern world.” Even though the YouTube channel their main product, I haven’t watched many of their videos. Instead, I listen to the podcast, where they might spend three or four or five episodes talking through what will eventually become a 5-minute video. The creators, Tim Mackie and Jon Collins, are fun and easy to listen to and have a great dynamic. My good friend Jake Blair has used their video series quite a bit here in Arequipa and turned me onto their podcast. The Bible for Normal People is just a few months old but has quickly become a favorite. Pete Enns and Jared Byas interview brilliant guests and try to make their scholarship and experience accessible to a broader audience. I’ve enjoyed every one of the first eleven episodes, though some episodes may not pass the “Bible for normal people” test. I’ll link to some favorite episodes from these three new (to me) podcasts soon. My favorite tech and Apple-focused podcasts are still The Talk Show and Accidental Tech Podcast. I also listened through the entire backlog of Hello Internet and am now current with it. I love On Being with Krista Tippett (though I can’t stay subscribed because the current feed publishes both the main interview and an unedited version of the same interview, so I just pick the episodes I want to listen to when I run out of other things I want to listen to). I occasionally listen to an episode of You Made it Weird with Pete Holmes. He’s a tremendous interviewer, has amazing guests (I don’t know half of them, but they’re famous, so you probably know them), and the backlog is an endless archive of hilarious and fascinating conversations. And I’ve found Personality Hacker to be fun and enlightening (thanks to Michael Daniel for the recommendation). Here’s a screenshot of my primary playlist in Overcast, organized by priority (that means that as new episodes are published from any of these podcasts, the playlist sorts them based on my preference). You’ll notice that my love for tech podcasts still rules, but the spiritual/religious world wins out in quantity. Then again, if we count by sheer runtime, The Talk Show might win single-handedly with episodes like this massive, 3-hour extravaganza. Have no fear—I listen to all of these at 2x speed with Smart Speed turned on, so a 3-hour episode only takes me about an hour and 20 minutes to get through. It would be impossible to listen to as much as I do at 1x, and 1x now sounds unnaturally slow. One of the best interviewers of our time, Krista Tippett, interviews one of the great thinkers our time, Richard Rohr. The result is well worth 52 minutes of your time (Overcast). The ‘truly human’ is always experienced in vulnerability, in mutuality, in reciprocity. Vulnerability transforms you. You can't be in the presence of a truly vulnerable honestly vulnerable person and not be affected. I think that's the way we were meant to be in the presence of one another. Do you see your life as something you create? Or do you see your life as something that is happening to you? How much of our lives do we live somewhere else? We live the week for the weekend. We live the month thinking about our next trip. We work this job for the next job, as a step-stool or stop-gap. We go back to school, because after that we’ll finally do what we were made to do. Dream big. Make plans. But if we live only in the future, we’re missing it. Sometimes it’s not the future that drags us away, but the augmented present. It’s a present space distorted by a constant drive to refresh our feeds. Social media are another harmless aspect of our lives—important and powerful, even—until we let them consume our every waking moment. We no longer live here, but are living there, thoughtlessly, constantly in that world. And we fail to recognize that there is something divine about this breath. How to Be Here is a mindfulness book, not about withdrawing but about being radically present. It’s an easy read with lots of one-line paragraphs and 3-page chapters (i.e. classic Rob Bell). I actually read this book on paper! The book is about embracing your God-given capacity to reflect God into the world in ordinary, everyday work. You can call it God’s image. Call it divine breath you breathe. In the midst of suffering and joy, work and recreation, we are spiritual beings who, by being present, can experience God and people and life in life-giving ways. All work is ultimately creative work because all of us are taking part in the ongoing creation of the world. Could anything be more connected to the ongoing creation of the world than literally, physically bringing new human beings into existence and then nurturing that new life as it’s shaped and formed? To my accountant friends, he talks about accountants as creatives, too. Think about your day yesterday. Do you suffer from any of these? To be here is to embrace the spiritual challenge of your ikigai, doing the hard work of figuring out who you are and what you have to give the world. Nothing like a Japanese word to get you thinking about why you’re here. I love that he helps you think through dropping everything to do that thing you love full time versus doing what you love as a hobby. Not convinced? Listen to Luke Norsworthy talk to Rob Bell about the book. You don’t read books? Rob Bell will read it to you. Even if you don’t read it, take a week or two to think about how you can be more present—at work, in traffic, in your relationships, doing what’s difficult, and doing what you love. Does being here scare you? That’s fine, take your time. We’ll be here when you’re ready. In the summer of 2012, I had to face the Bible class I had taught for two years and announce that I wasn’t sure if I believed in God anymore. In fact, I was basically sure I didn’t. I’ve always tried to be transparent with people, and I wasn’t going to pretend to believe in something I knew I really didn’t. What it came down to was the Bible. No book in history has been as consequential or influential, but I could no longer get behind it. Either my view of God was correct or my view of the Bible was correct. It took me three years from that summer to arrive at what I now believe. And once I figured out what I believed (and I did), it took me another year just to figure out how to talk about it. Today, I believe in God more strongly than I ever have in my life, and, in the interest of remaining transparent, I want to spend the next several weeks talking about where I’m at. Because I really, really like it. Chris is a friend of mine and I respect his thinking. I’m glad he’s able to share this as his perspective is essential for the church. He’s a lawyer by trade, which makes him a non-professional theologian who has gone deep because of his own questioning and pursuit of truth. That doesn't diminish his contribution. If anything we ought to pay even closer attention because he doesn't get paid to do this. The fossil record is more clear on this score than my early theologically trained but not biologically trained religious mentors had me to believe. Inerrancy alienated me and continues to alienate many from people who for decades of their lives personally have carried on the quiet and meticulous investigation of difficult scientific questions. In a desperate effort to cling to what we’ve always known, we fall victim to the pseudo-scientific word salads that evangelical leaders employ to keep us within their orbit. This often takes the form of folksy soundbites that, to people with no background in these subject matters, make scientists seem out of touch and too big for their britches. He’s halfway done with the series, so it’s a perfect time to dive in. After this, you can read parts 2, 3, and 4. The city’s sinking is connected to an ongoing water emergency. How Mexico City residents get clean water is an engineering marvel. But any given day there is 20% of the population that can’t count on it. And when the city’s population is over 20 million, 20% is immense. We’re only starting to see the effects of the last several decades of urbanization. There are bound to be many more stories like this in the near future. This is a new type of water crisis. I can’t help but wonder what role non-profits like Charity: Water, who have made it their mission to give access to clean water to rural populations, will play in addressing it.